The Heritage Fair program encourages students to explore the history of our country in a dynamic and hands-on environment. Students use the medium of their choice to recount the stories of the people, events, familial events and key moments from Canadian history and present their research in a public exposition at their school. 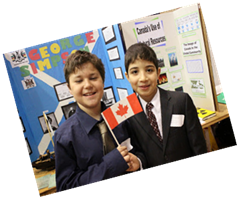 The best projects from schools are invited to showcase their work at the Red River Heritage Fair. The students present their research, respond to questions from judges, and discuss and share their project with fellow students, parents, teachers, and community members. But it is much more exciting than that; students participate in interactive workshops, join in a scavenger hunt, meet others students and share their history projects thus creating a fast-paced history learning day. 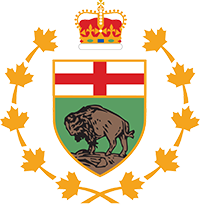 Workshops are designed for students and provided by local museums, historical societies or organizations promoting Canadian history and heritage. When does the Red River Heritage Fair take place? The Red River Heritage Fair will take place May 3, 2018 at the Duckworth Centre, U of Winnpeg. Why participate in a Heritage Fair? 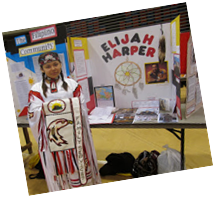 The Heritage Fair program supports Manitoba curriculum and promotes a multidisciplinary approach to teaching and learning. Heritage Fairs gives students a chance to share ideas and be heard, while allowing them to be creative and to develop their individual skills and talents. 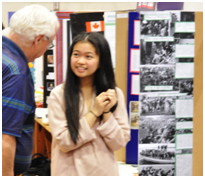 Creating a heritage fair project allows students to develop a number of communication skills, including research, interviewing, writing, editing, and public speaking. The nature of the topics explored by students often leads to valuable intergenerational dialogue. 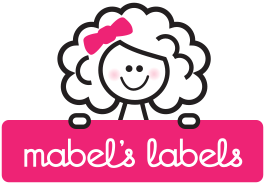 The exchanges that occur at home, at school and in the community are numerous. Participation in Heritage Fairs also contributes to a sense of citizenship. Students develop deep roots and relationships in their communities, and gain the confidence and skills to become active citizens in the future.